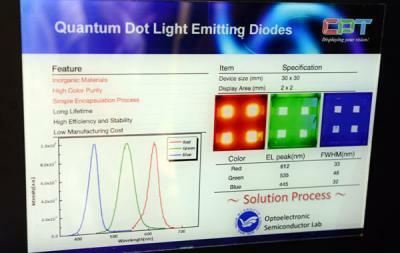 Taiwan-based Chunghwa Picture Tubes (CPT) says that it is developing Quantum-Dots displays (QD-LEDs) produced using a printing process. CPT says that QD-LEDs offer pure-colors, long lifetime and are more efficient and stable compared to OLED displays. CPT hopes that a printing process will enable low cost QD-LED displays. CPT's Material Technology Division manager estimates that the major obstacles have already been overcome - although the performance of quantum dots is still lacking and CPT is continuing to research and develop QD materials. CPT estimates that it could start mass producing QD-LED displays within two years. Several companies are now actively researching QD-LED displays. Reports in 2016 suggested that SDC may start to produce QD-LED TV panels by 2019. Early this year BOE demonstrated two QD-LED displays, 5" (320x240) and 14" (960x540). CPT has been researching several cutting-edge display technologies. A few days ago we reported on a collaboration between imec and CPT for ultra-high resolution OLED display that was patterned using photolithography, while in 2015 CPT demonstrated a flexible OLED prototype based on an OTFT backplane. In August 2016 it was reported that CPT aims to produce IGZO OLEDs in a 6-Gen fab it is building in China. To avoid confusion, the industry needs to come up with a new name for the QLED technology because Samsung ruined the old one with it's fake QLED... You guys used three different abbreviations (QLED, Q-LED, and QDLED) in a single article - that's ridiculous! Electroluminescent QD display or electroluminescent QLED display (Samsung's version).